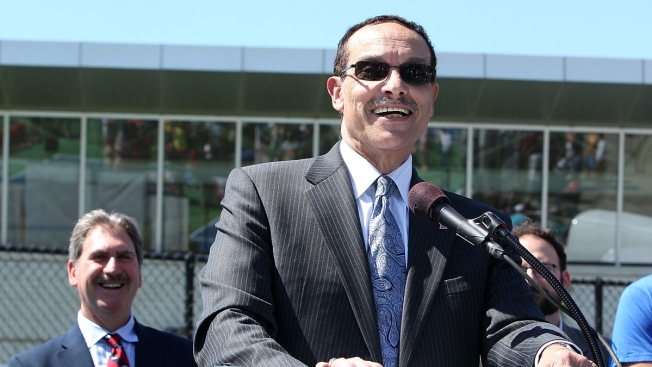 Mayor Vincent Gray finally took the plunge. On Monday, almost a month to the day from the Jan. 2 deadline to file petitions for the April 1 primary, Gray showed up unannounced at the D.C. Board of Elections to formally sign his re-election papers. "I just came down and filed to take out petitions for re-election," he told NBC4, which broke the story. "We're actually going to have a kickoff event in early 2014." The calendar was no friend to the mayor, whose 2010 campaign remains under federal criminal investigation. Gray had to file for re-election to preserve his chance of being on the ballot. If Gray had not run for re-election -- he loves the job -- it would have been a clear signal that he feared or expected some type of criminal charge against him. He always can withdraw from the race at any time if that unseemly situation presents itself. If no legal action is forthcoming, he's in the race to win. It's a gamble. Gray maintains he didn't do anything wrong in the 2010 campaign. Four others associated with it -- including two of his close pals -- already have pleaded guilty to orchestrating the infamous $650,000 "shadow" campaign that helped elect him. But Gray's running is something of a taunt to U.S. Attorney Ronald Machen. The prosecutor recently said publicly that some people connected to Gray's 2010 campaign aren't cooperating with -- in fact, are obstructing -- the investigation. And he famously said, "There's there there," in response to questions about why his lengthy probe is taking so long. In response to reporters' questions about Gray's decision, the prosecutor's office on Monday issued a simple statement: "The investigation into the 2010 mayoral election is continuing." ■ Hitting the roof. NBC4's Mark Segraves last week broke the story that the Washington Nationals had recently and quietly approached the city about paying for a $300 million roof over the baseball stadium. We'll spare you the suspense. It's not going to happen. There's still taxpayer angst and anger over the original cost of the stadium, constructed in 2008 for about $700 million. People remember the team owners haggling over the cost and look of even the pillows being used. There apparently is zero interest among city officials for the baseball roof. Ward 2 D.C. Council member and mayoral candidate Jack Evans has championed the city's big league aspirations for several years. He helped guide construction of the city's convention center, the Verizon Center and the baseball stadium -- all against noisy opposition. Evans likes to say without those three significant public works projects, "We'd be Detroit." While that's not literally true, you know what he means. So what does Evans think about a taxpayer roof for the Nats? "I don't think it makes any sense at all," Evans told NBC4 last week at the 14th annual Safeway Feast of the Season at the Washington Convention Center. "First of all," he said warming to the subject, "the city is not going to pay for it. So, if there were any addition made to the facilities, it would have to be done by the team." ■ The future of RFK. Some people may think a new stadium at RFK is a pipe dream, but the city is trying to determine the site's future. The current facility opened in 1960. The Washington Post and the Washington Business Journal reported last week that the city's sports authority -- Events DC -- is going to explore what might happen on the site and report back Jan. 3. Maybe a domed stadium for the Redskins? ■ Radio silence? A few months ago, several news organizations complained when the Metropolitan Police Department encrypted its main general purpose radio channel. Police Chief Cathy Lanier said criminals could listen and alter their behavior. The media complained, but didn't challenge the police in court. Now the D.C. Fire and Emergency Medical Services Department is following suit. It has said it will encrypt the department's radios at the end of the year. But there's less silence about the fire department plan. "It's extremely important to have transparency, to have information given to the public" in that department, said Ward 6 D.C. Council member Tommy Wells, chair of the public safety committee and a candidate for mayor. He said he had studied the issue closely. "From what I can tell," he told us, "there's not a major public service that's gained by encrypting all of the fire department information." Wells is due to hold a public hearing on the department at 11 a.m. today at the Wilson Building. As a reporter, the Notebook has written regularly about how local and federal agencies are shutting down access to the media and the public in the name of "security." Soon enough, there will come a time when there is serious police misconduct or a fire department mishap. Or police and fire will do some of their extraordinary work that deserves our attention and praise. The watch words should not be "maintain radio silence."